Physicists are fascinated by neutron stars because their dense interior acts as a laboratory for exotic materials beyond what we find on Earth. Today’s paper suggests that flux tubes, which are quantum objects that exist in superconductors, could form bundles inside a neutron star – this unusual behaviour challenges the standard picture we have of terrestrial superconductors. 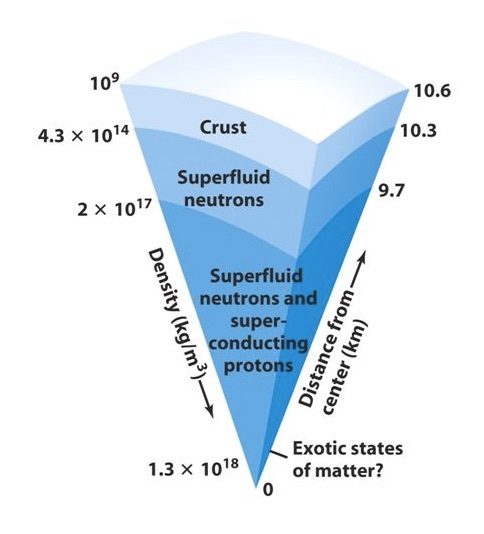 Deep in the interior of a neutron star, there is a super-mixture, consisting of a proton superconductor and a neutron superfluid (see Figure 1). A superfluid is a substance that flows without friction. We know there is likely to be a superfluid in the interior due to observations of rapid neutron star cooling rates (the canonical example being Cassiopeia A). A superconductor is a material without any electrical resistance. 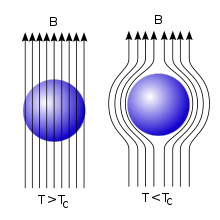 In general, there are two kinds of superconductors, which have been dubbed type-I and type-II states. Conventional wisdom suggests protons in a neutron star form a type-II superconductor, but really this is an open question: it is entirely possible that the proton superconductor is in a type-I state. Indeed, this claim may be supported by observations of neutron star precession. As a compromise, we can hypothesise that a transition between type-I and type-II occurs at some depth in the core of a neutron star. We therefore want to understand the behaviour of the superconductor at this transition point: how is the standard picture of the type-I/type-II transition modified in the presence of the neutron superfluid? Before we can investigate the more exotic superfluid-superconductor mix, we need to consider the case of a superconductor that is not modified by the proximity of a superfluid. We begin by defining what is meant by type-I and type-II superconduction. Type-I superconduction is characterised by the Meissner effect. When the temperature of the material drops below a critical temperature , the magnetic field no longer penetrates the superconducting material; all magnetic flux is expelled when the transition occurs. Type-I superconductors refuse to let magnetic fields pass through them once they are cooled to a certain temperature (see Figure 2). Type-II superconductors are slightly different: magnetic flux is admitted into the bulk of the superconductor, but in a very particular form. Defects called flux tubes thread the superconductor; the entirety of the magnetic flux is concentrated into these narrow tubes (see Figure 3). Each flux tube carries a specific, tiny quantity of magnetic flux called a flux quantum. To visualise this phenomenon, imagine curtains tied loosely by a cord. Here, the magnetic field lines are the curtains, and the cord plays the role of the flux tubes. The superconducting material will resist the spreading or release of the field lines from the grip of the flux tubes in the same way that the cord binds the curtains in place. This phenomenon is referred to as quantum trapping or quantum locking, because all of the magnetic flux is funnelled into and trapped in these quantum tubes. It can also be called a mixed state because it is a combination of the normal state (flux penetration) and the Meissner state (flux expulsion). Figure 3: Animation of the transition between a normal non-superconducting state and type-II superconduction, induced by decreasing the temperature. The blue lines correspond to magnetic field lines. Animation taken from http://i.imgur.com/gROHZnG.gifv. 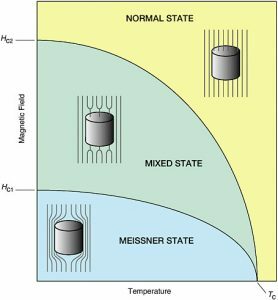 The transition between the Meissner state and the mixed state can be characteristed as a function of applied magnetic field and temperature and plotted as a phase diagram (shown in Figure 4). There are three distinct regions corresponding to each of the three states (Meissner, mixed and normal), indicating we can transition between the different phases by varying or . In the mixed state region of the phase diagram, the flux tubes carry only a single quantum of flux each; the flux tubes repel each other to avoid fusing into a larger flux tube carrying more than one quanta of flux. By decreasing , we could induce a transition to the type-I region. This would entail a sudden, clean transition into the Meissner state as the flux tubes are expelled from the sample. However, in exotic superconductors, a diverse zoo of flux tube phases can emerge at this transition point. In a neutron star, the standard rules no longer apply – with a superfluid component present, there is no longer a clean transition between flux tube penetration and flux expulsion at the type-I/type-II boundary. Rather, exotic flux tube configurations emerge. Alford and Good, the authors of today’s paper, find that the interaction with the superfluid leads to multi-quantum flux tubes, which carry more than a single quantum of flux. The single-quantum flux tubes merge to form these multi-quantum states in the vicinity of the type-I/type-II boundary. Figure 5. Simulations show flux tubes forming clumps in the presence of the superfluid in a neutron star core. Figure courtesy of J. Thorarinson & M. Gleiser at Dartmouth College. 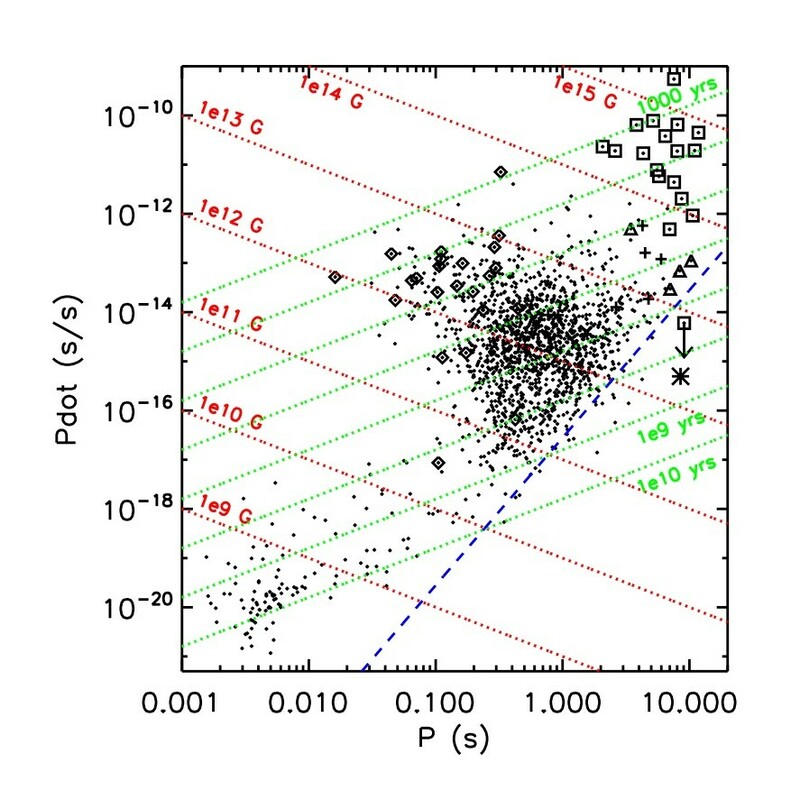 See APS Focus article https://physics.aps.org/story/v22/st3 for further detail. Related work by Bababev and Speight suggests a similar disruption of the ordinary type-I/type-II transition in their study of a mixture of two superconductors: the flux tubes form clumps in their simulations (see Figure 5). This is slightly different behaviour to that computed by Alford and Good, as the flux tubes cluster into bundles of single-quantum flux tubes, rather than merge into larger flux tubes carrying more than one quanta of flux. Both papers find exotic and intriguing behaviour at the type-I/type-II transition in a neutron star’s superfluid-superconductor mixture – there is clearly a rich vein of untapped physics in this domain. Furthermore, the flux tube bundles could perhaps be observed astrophysically through their influence on the rotation of the neutron star crust.